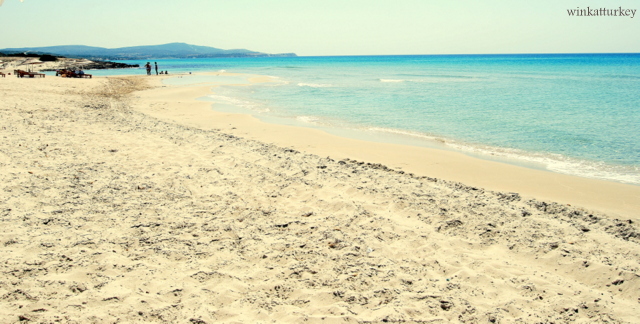 Cesme Peninsula has some of the best beaches on the Turkish coast Aegean Sea. Çesme situated only 85 km to the West of Izmir It is the capital of the District of the same name. It is one of the areas preferred by the Turks for their holidays. All this coastline is known for its fine sand beaches , Crystal clear waters and its wonderful climate. One of the beaches to visit in the area is Altinkum Plaji, the first thing that struck me when I was taken there for the first time was the amazing color of the water, a blue colour I will never forget. 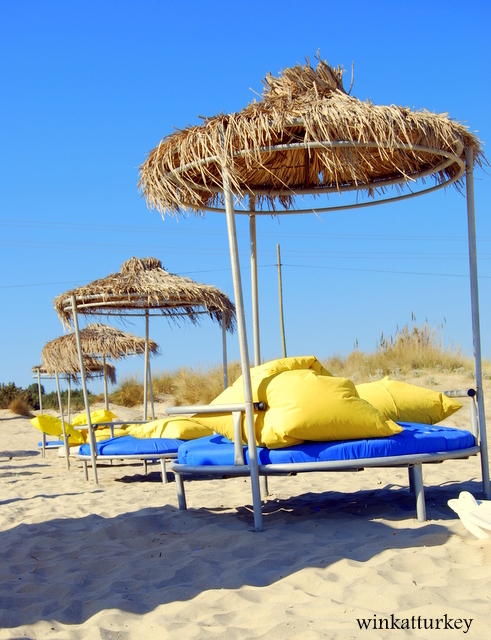 Altinkum beach is about 10 km from the urban centre of Cesme. After leaving the main road when you see the signs indicating Ramo Beach and Okan´s Place, We will take a road whicht will take us towards it. Even from the car you will be impressed for the view of the coast, the water colour and calm. We have always spent our holiday time in Cadiz and there waves and tidal changes are normal, When we got to the beach and look at the sea, it seems like a huge lake. But I recommend you to , water is usually cold, what is really nice, because temperatures use to be very high in summer. Waters are the perfect place to enjoy some water sports and the beach is a great place for families with children. Beach clubs are very popular in this area, They provide umbrellas (really necessary) and sunbeds, the price to rent an umbrella and 2 sunbeds is around 15-20 Tl ( 7/9 euros) full day. all of them have a place that serves food and waiters serving you even in your own sunbed. food is quite good and all of them serve all types of beverages, even cocktails. My daughters love to order Murat or another waiters french fries (homemade) with ketchup and mayonnaise before eating and they enjoy really much the snack . sometimes we buy filled mussels too. These, the need to try, It is typical that mussels stuffed with rice and spices are sold on the beaches and in the streets of cities. Instead of eating chips or shrimp as in Cádiz the Turks on the beach , eat stuffed mussels and for them is a tradition. We love it, the mussels are sold in this beach are pretty good. Another food that is sold in the beach, corncobs and I have to say that they are the best I have ever eaten in my life. A guy making a special noise to announce himself . On the beach there is also the possibility of renting the typical banana, kayak, watercraft and various aquatic leisure gadgets. Always haggle on price! The beach in summer and weekend gets very crowded, though you can call any of the clubs and book in advance umbrella and chaise. Midweek, a paradise. It is usually in July and early August when it is busy. Taking a bath here is a pleasure, fresh water, lets see crystal clear and calm at all times clear sandy bottom and even fish. There are little fish that when you stand still for a while, chatting with someone, see as they approach your feet and you stick small nips. 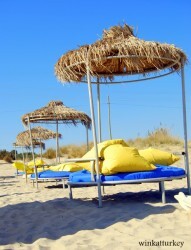 There are at least 3 clubs on the beach, we usually go to “Golden Beach” o a “Ramo Beach”. The name of the other is the “Okan´s Place”. The atmosphere on the beach is great, people who come here are open-minded and liberal. Do not usually see many veils here. If Veni this area on Dude in the Daro venir a dip. Ana, the beaches here really are beautiful, but much more so when you are on them. You have included great information about the beach. We will be there several times this summer. Wish you and family could be there to join us. Dana, we are really looking forward to see you again. Enjoy those beatiful beaches!! !